Selma University, located in Selma, Alabama, is private historically black, bible college. It is directly affiliated with the Alabama State Mission ary Baptist Convention. Selma University has a rich, unique and interesting history. Founded in 1878 the university was first called the Alabama Baptist Normal and Theological school and was established to train African Americans as religious teachers and ministers. Well known men, including the Reverends James A. Foster, William H. McApline and R. Murrell were among those whose founded the school. See the degree programs that are offered at Selma University. 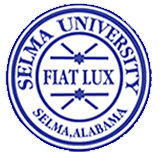 See the distance education degree programs that are offered at Selma University. See what it costs to enroll at Selma University and how many students are receiving scholarships, grants, or loans as financial aid to help cover the costs of tuition. See the admission requirements for Selma University. Find out how many students apply and how many are accepted. View a graphical breakdown of the gender, age, and ethnicity of currently enrolled Selma University students.